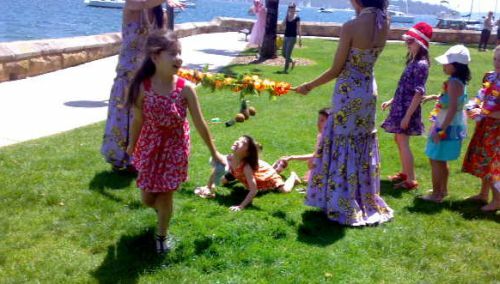 I want to start a Kids “Birthday” Theatre group for the Darlinghurst / Potts Point area for kids around my age (born 2oo2). We don’t have much happening at our school, and the local theatres aren’t very supportive. Instead, for each party, why don’t we beforehand, pass around copies of a School Play scipt, allocate parts, then at Beare Park rehearse for a while, then put on the Play. Would probably average out to at least once a month. Could even give us something to do during the School Holidays. Imagine where we could be by the time we are in High School, compared to aimless games and stuff. By then we might develop into a real Theatre Company. One day we might even be able to talk Darlo or Griffin/Stables/Nimrod Theatres into finally seeing the 2-way WIN WIN. We would have costumes, and masks if you like, then video it and put it up on our Youtube Theatre ChannelDVSA. I’m so bored with TV and I don’t want to do ballet or play soccer or pay $200 a pop at ATYP. I want to grow up a Producer. Anybody else out there thinking like me and my Dad? Well, shake a spear at ignorance then!